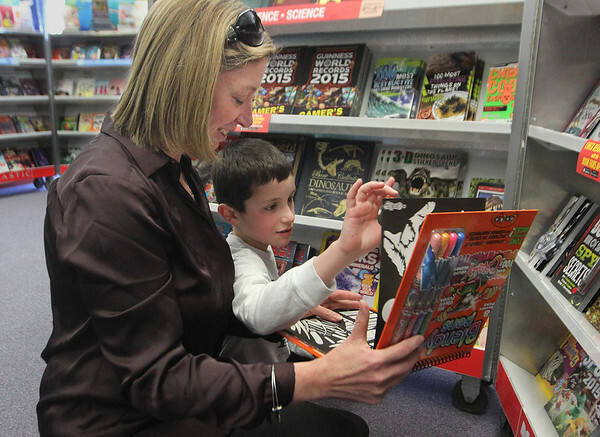 Third grader Michael Corrao and his mother Diane, a PTO member and event volunteer, look through books Friday during the Essex PTO's annual Spring Book Fair at Essex Elementary School. Proceeds from the event go toward the purchase of books for the school's classrooms and library. Although the two-day fair is over at the school, parents can still go online to make book purchases benefiting the school until March 24 through a special webpage, which can be reached by going to http://www.scholastic.com/fair and typing in an Essex zipcode.